Urban gardens, like the one pictured above in Kibera, Nairobi, allow residents to come together for healthier, happier communities. Photo by Colin Crowley/Flickr. CNN recently described Cape Town, South Africa as being in the midst of a “vegoultion,” with hundreds of new community gardens and urban farms popping up throughout the city in recent years. The city’s “Green Clusters” are helping to improve the local environment while providing important social benefits and helping local residents eat healthy. Cities worldwide are challenged to create welcoming environments that connect residents to their city and create a strong social fabric. Community gardens are one way to help residents take a creative approach to making their cities more appealing, healthy, and sustainable. Community gardens are a powerful tool to turn decaying, unappealing urban spaces into community assets. In the United States, community gardens have been found to increase neighboring property values. New York City’s history of urban gardening demonstrated the ability to revitalize neighborhoods at a low cost. According to the EcoTipping Points Project, more than 800 gardens have helped engage the community, decrease crime, improve diets, and create cleaner environments in the city since the 1970s. Many cities are turning to community gardens to address unused spaces. As of 2013, Detroit had about 80,000 vacant buildings. Residents, non-profits, and corporations are joining together to repurpose vacant lots for community gardens, creating more livable areas while reducing blight. Through engaging marginalized residents, urban agriculture can create more inclusive communities. 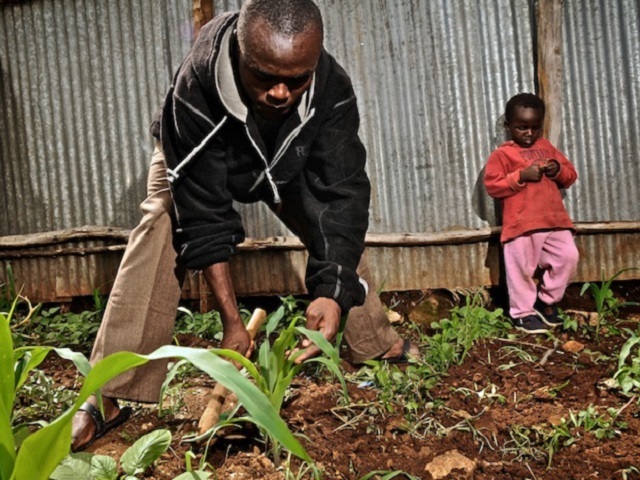 A study of five informal settlements in South Africa found that while urban farms only modestly contributed to food security and increased income, they had a wide range of other benefits for women that included reducing social alienation and family disintegration. The koyaproject is a global platform that helps build community gardens worldwide to increase social inclusion, educate children in self-sufficiency, nutrition and sustainability, and beautify neighborhoods, among other benefits. They focus on building gardens in community spaces like orphanages, schools, churches and temples, and are using crowdfunding to raise money for projects. In addition to helping create social cohesion and an attachment to one’s city, urban agriculture is helping improve access to healthy food while providing valuable employment opportunities worldwide. Urban farms can help increase access to fruit and vegetables in developing countries, where their consumption is between 20 and 50% below FHO/World Health Organization recommendations. In Ethiopia, the Urban Gardens Program for HIV-Affected Women and Children has benefited over 110,000 women, orphans, and vulnerable children by providing access to healthy food, new economic opportunities, and stronger support networks. More and more city residents and NGOs are taking matters into their own hands to shape the cities they want to live in. With community gardens increasingly intertwined in urban environments, residents are creating cities to thrive.